This Historical Maps guide contains information on how to find maps of various regions and periods throughout history and introduces you to tools to help you create visual representations of historical data using those maps. FORM: Author. Map Title. Scale. "Title of Website." Date created/published. <url> (date accessed). EXAMPLE: Visscher, Claes Janszoon. Leonis Belgici. Scale not given. "David Rumsey Map Collection." 1611. <http://www.davidrumsey.com/luna/servlet/detail/RUMSEY~8~1~275937~90049132:Leonis-Belgici-?amp;qvq=sort:Pub_List_No_InitialSort,Pub_Date,Pub_List_No,Series_No;lc:RUMSEY~8~1&mi=8&trs=60081&sort=Pub_List_No_InitialSort,Pub_Date,Pub_List_No,Series_No&cic=RUMSEY~8~1&widgetType=detail&nsip=1&nsip=1> (Accessed June 8, 2015). FORM: Map author. Map Title. Scale. In: Book/Atlas author. Book/Atlas Title. Edition. Place of Publication: Publisher, Date, Page. EXAMPLE: Thera Fresco. Scale not given. In: Harley, J.B. & Woodward, David. The History of Cartography: Cartography in Prehistoric, Ancient, and Medieval Europe and the Mediterranean. Chicago: University of Chicago Press, 1987, Plate 3. FORM: Map author. Map title. Scale. In: Article author. "Article Title," Journal Title, Volume (Date): page. EXAMPLE: Gough Map of Britain. Scale not given. 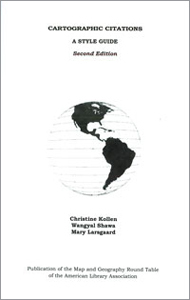 In: Lilley, Keith D., Christopher D. Lloyd, and Bruce M. S. Campbell. "Mapping the Realm: A New Look at the Gough Map of Britain (c.1360)," Imago Mundi: The International Journal for the History of Cartography, 61:1 (2009): 29. FORM: Author. Title. Edition. Scale. Place of publication: Publisher, Date. EXAMPLE: Prakash, Om. Kingdom of Shivaji. Scale ca. 1:1,875,000. Delhi: All India Educational Supply Co., 1986. * adapted from Kollen, C., Shawa, W., & Lasgaard, M. (2010). Cartographic citations: A style guide (Second ed.). Chicago: American Library Association.